Recovering Working Mom: Get real . . .
Before I tell you of my latest adventure into insanity, here’s something that Stay at Home Mommies won’t tell you – they all have a fetish, and they spend hours pursuing whatever that is. For some, it might be a “Fifty Shades” type fetish (which I admit I went through too – Ok, maybe not to that extreme, but we all know that HfH just dropped his jaw and found an attorney to put a gag order on me); for most mommies (including myself) it’s much more boring than that. Here’s what I’ve realized . . . we have approximately 6 hours a day to “do whatever we want”. But, here’s the kicker, 75% of that time is spent doing sh*t for SOMEONE ELSE. Whether it’s volunteering in the classroom, cleaning the house, grocery shopping, making endless dentist, dr., and orthodontist appointments, or making the third trip to the school that day because someone forgot their lunch. That leaves 25% of my time to workout, blog, work for my part-time job, or research and implement my latest obsession (that was definitely created because I spent too much time on the stationary bike reading magazines or watching the Today show). Which brings us to my “fetish” – real food, and while I’m at it, limiting the amount of plastic that we use in our house. And by the way, I would not have developed this obsession were it not for the hours I spent at double header softball games, so technically the Superego (oldest child) has no one but herself to blame for this. Miraculously, the whole family has agreed to a 30 day “trial” of this real food game and mommy will track a few items including: 1) did we save money; 2) did we throw away less food than before; 3) do they sell it at Costco; 4) How much plastic did we save; 5) unexpected favorites; and 6) complete bombs!! 1) HfH and the children have concluded this is actually just mommy’s excuse to torture them through food and buy more sh*t to entertain herself during the day. But here’s what mommy’s learned – as with any hobby, this one is expensive at the beginning and the only way you are going to get your Costco going husband to allow you to buy organic produce bags and organic cotton to make your own bags is if Amazon sells it and/or you make it a condition of him getting a new car. New favorite - Simple Ecology organic cotton produce bags. Daddy doesn't like them because you can't see what's in them. Mommy's response - "open the bag and peek inside . . . lazy @$&!" Of course, I neglected to check if they had a mesh version, and of course they do. So, I would recommend those instead. 2) DO NOT start a real food challenge the week of your birthday! Mommy’s an idiot. I decided to start this little experiment when we have 4 parties to attend, including my own birthday party. So, in addition to allowing myself to cheat, Thursday, everyone got a “free birthday” pass to eat whatever they wanted. I’ve never seen three children scarf down so much pizza, cookies, rice krispy treats and brownies in a 30 minute period! I cannot believe they didn’t throw up after that. 3) Only shop at 2am when there is NO CHANCE you will run into your children’s friends at the grocery store. Have you ever tried to convince a 10 year-old that she is going to be “so much better off” for having eaten baked potato chips than her friend whose cart is filled with pop chips and pirate booty! CRAAAAAAP. Even mommy wants a cart full of pirate booty. 1) Did it save money – Jury’s still out. Need a few more weeks to fully assess, particularly in light of all the dining out we did this week. Not to mention, if we didn’t save money do you really think I’d admit that here for HfH to keep for all eternity?! 2) Did we throw away less food than before – definitely! And, Quote of the week – “these vegetables are not anywhere close to past their prime like our veggies usually are” - HfH as he’s cooking dinner on night one! 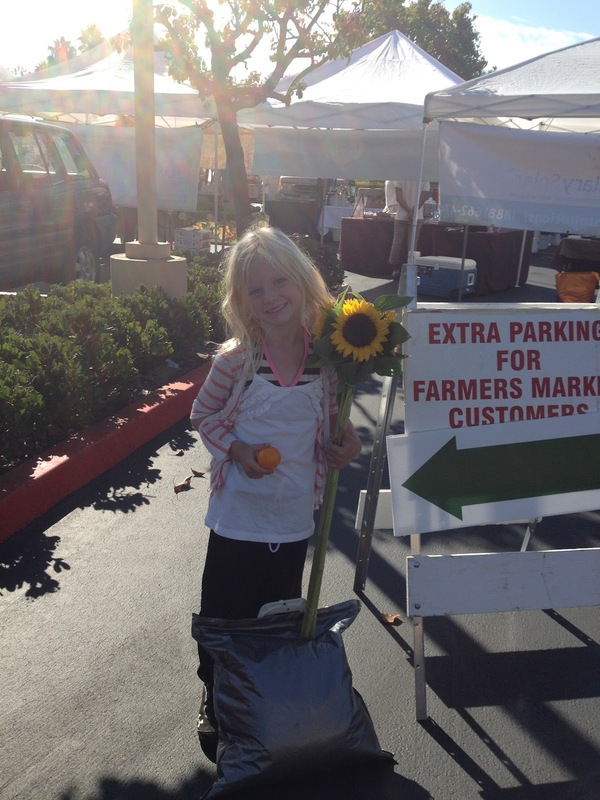 3) Do they sell it at Costco – some of the organic produce they do, and mommy bought that. She also bought glass bowls for storage. Everything else we bought at the Farmer’s Market or grocery store. We got out of Costco for a record setting $46! Coconut oil, carrots, yogurt and glass bowls. Swear to you, that's all I bought. I think the Costco employees weren't really sure what to make of me! 4) How much plastic did we save – at least 15 bags. Between the reusable grocery bags and reusable produce bags, we saved at least that many. I lost count. 5) Unexpected favorite – Greek yogurt, honey and granola. The girls inhaled this! 6) Complete bomb – Honey wheat bread made in the breadmaker. “Too crumbly and thick”. I think that’s “kid speak” for “if it don’t have corn syrup and something that’s partially hydrogenated, it is not worth dirtying my mouth for”. 1) Bought fresh produce at the Farmer’s Market – I made a pact with myself to only buy as much as we could eat in one week. I overshot and I’m learning just how much we do and don’t eat. This week we went to the Rancho Santa Fe Farmer's Market. It was nice, but pretty small. I'm not sure what most markets are like, so more to come on that. We had to add $3 for Sunflowers. Those just make everything happy! Please note the "bra" on the Id. That's her bathing suit top that she hasn't taken off for four days. 2) Go to the grocery store 3 times because you didn’t anticipate how popular some items would be and how unpopular others would be – oh, and duh, you forgot to buy cheese! 3) Make a menu – I realized AFTER I went to the Farmer’s Market that there were only 3 nights this week that we would be together as a family. Had I looked at this beforehand, I wouldn’t have bought some of the veggies for dinners. 4) Play “Iron Chef” – I gave HfH a list of the ingredients I purchased and he came up with 3 dinners to make (yes, he insists on cooking dinner, I promise that I do not force him to do this). This ensured that we used everything we bought. 5) Subscribe to 100 days of real food blog. She has great recipes and suggestions, particularly for school lunches. 6) Purchased organic cotton to make my own snack bags. More updates to come on that one. I called 4 stores, and Beverly's fabric in Clairemont was the only place that sold it. Extremely limited selection. 7) Purchased organic cotton produce bags. As I said, I love these things. 8) Purchased Silicone Pop Makers for homemade smoothie push pops for the girls lunches – more to come on that. The girls inhaled the smoothie that we put in these. LOL, sorry I had so much crap in my cart! Chloe felt so bad for McKenna. I think you need to take a photo of every lunch you make (or the girls make) and post it. Just add this simple task to your day! Do you think we'll get internet at the game? Maybe we can complete our menus as well as organizing our bon bon eating days. Stepped off the hamster wheel . . .
Playin' with the Queen of Hearts. . .
Woa woa, I gotta go . . . back to school . . .